17103 Fri Jul 12 14:38:32 EDT 2013 Carol Bouldin Yucaipa, CA , US Your hypocrisy is unbelievable. 17101 Thu Jun 27 00:20:47 EDT 2013 Anonymous Boynton Beach, FL , US & GE & Others should do so as well! 17100 Thu Jun 27 00:20:02 EDT 2013 Joanna DeMore Boynton Beach, FL , US & GE & Others should do so as well! 17096 Sat May 25 18:40:17 EDT 2013 angela alvarez los angeles, CA , US You guys have done enough harm...now it's time to do some good! 17089 Wed Apr 24 16:41:22 EDT 2013 Anonymous Spirit Lake, ID , US There is nothing about ExxonMobil that I like. Nothing. 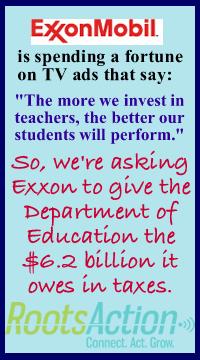 Give something back, ExxonMobil - and do it for the right reasons - because it's the right thing to do.